There will be practice time between each Splash competition as time permits. Please check in at least one hour before your Splash and at least one hour prior to the first Finals on Sunday for the finals. The dock will be a 40-foot Dock. Pre-Registrants will be given PRIORITY for entry in a Splash. Entry email confirmation -- please provide email address with registration. 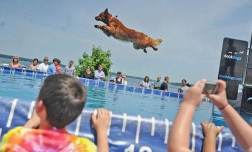 Splash Registration Fee is $25 and $25 for additional Splash competition entered, payable to Splash Dogs (cash, check, or Visa/Master Charge). $25 to practice. If you decide to compete your practice fee will apply towards Splash entry fee. Practice is for Open dock practice.